Childhood lead poisoning remains a major environmental health problem in the United States. o Put their hands or other objects covered with lead dust in their mouths. o Eat paint chips or soil that contains lead. o Breathe in lead dust, especially during renovations that disturb painted surfaces. o Babies and young children often put their hands and other objects in their mouths. These objects can have lead dust on them. o Children’s growing bodies absorb more lead. o Children’s brains and nervous systems are more sensitive to the damaging effects of lead. 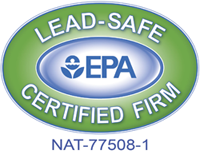 What does it mean to be a Lead-Safe Certified firm? As a contractor, we play an important role in helping to prevent lead exposure. Ordinary renovation and maintenance activities can create dust that contains lead. By following the lead-safe work practices, we can prevent lead hazards. * Contain the work area. EPA requires that firms performing renovation, repair, and painting projects that disturb lead-based paint in pre-1978 homes, child care facilities and schools be certified by EPA and that they use certified renovators who are trained by EPA-approved training providers to follow lead-safe work practices. Homescapes of New England cares about your safety as well as of our workers. We are confident that we will follow the procedures necessary to keep both your home and our workers safe from lead exposure. We believe in delivering unparalleled customer service and quality craftsmanship on every home we touch. Give us a call! We would be happy to give you a free quote on what you need for your home.